30 day trial/freeware - Can be unlocked to the full version by purchasing a license. Switches to freeware scanner mode on license expiry. Not just any scanners, but a combination of two world class products - the Emsisoft Anti-Malware, and the Ikarus Anti-Virus engine. Latest tests approve that both are cutting edge in Malware detection. Considerable performance improvement is possible thanks to the integration of the two engines on the lowest level. No double price - two top security products for the price of one. 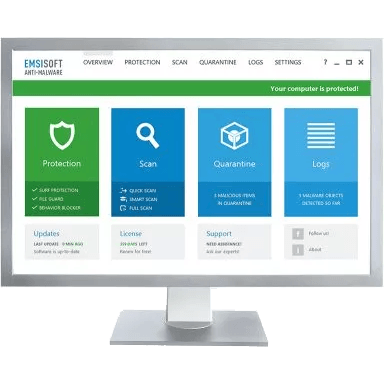 Unlike conventional protection systems Emsisoft Anti-Malware does not only check files, but it also constantly monitors the behavior of all active programs and raises an alarm as soon as something suspicious happens. For tough problems our helpful Malware experts are at your disposal for free. With their step-by-step advises, any infection, no matter how resistant it is, can be purged - guaranteed. Anti-Malware holds plenty of advanced options for experts to detect and delete Malware manually. For this purpose the integrated system analysis tool HiJackFree is included, and helps you to have all processes, services, auto-runs, open ports, browser plug-ins and host entries under your control. Stop Malware before it has a chance to harm you. The guard prevents dangerous programs from becoming active on your PC, blocking Malware through the use of unique behavioral analysis technology. Emsisoft Anti-Malware comes with an integrated automatic update feature, which easily and conveniently installs the several times a day available updates without you having to manage the process. New: Environment variables tester in the exclusions screen. Improved: Email validation in the false positives submit screen. Improved: Administrator mode timeout settings. Improved: Protection paused indicator on the Overview screen. Improved: CPU load during update process. Improved: Behavior Blocker: correct processing of exclusions for apps that are started after an exclusion was added. Fixed: Firewall application rules processing for files that are not accessible at boot time (encrypted drives) in Emsisoft Internet Security. Fixed: Memory leak in Emsisoft Internet Security. Fixed: Main screen out of position. Fixed: Occasional issue where File Guard did not start after a program restart.